Chemence Medical Receives FDA Clearance for Exofin® Tissue Adhesive - Chemence Medical, Inc.
Chemence Medical, Inc., a manufacturer and distributor of adhesive-based medical devices, announced it received Food and Drug Administration clearance to market and sell Exofin®, a new topical skin adhesive for wound closure. Exofin enters the market as the fastest polymerizing 2-octyl cyanoacrylate topical adhesive available and as the highest viscosity formulation in the industry. 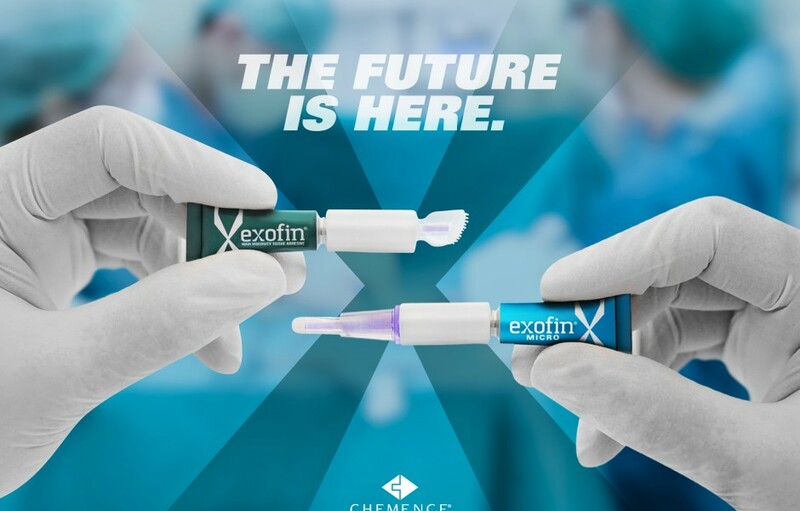 Exofin is available from Chemence Medical for immediate sale in two sizes, each with its own unique and innovative applicator. Exofin® High Viscosity Tissue Adhesive has a 1ml tube fill and offers users the highest volume per device available on the market today. Exofin utilizes a soft and flexible applicator with a transparent tip enabling the user to see the adhesive prior to expression and create a solid seal on skin, including uneven surfaces. Exofin® MicroTM has a .5ml tube fill and is ideal for small trauma induced injuries and single port incisions. Exofin Micro uses a clear silicone tip for precision applications while offering the same high viscosity formulation as the larger sized Exofin High Viscosity Tissue Adhesive. products are protected by a portfolio of patents covering various aspects of cyanoacrylate and mechanical technologies.